When they're not working with patients and helping them through clinical trials, the good folks in the Cancer Clinical Research Office in Arizona (lovingly referred to as CCRO) are looking for ways to help out in the community while improving their own sense of community. Like this past spring, when 16 volunteers spent a Saturday helping at one of the Phoenix Humane Society locations, giving their time, energy and resources to make some tails wag (or curl). Or last summer, when they brought in a speaker and took up a collection for the Alzheimer's Association to help provide ID bracelets for local families. When the page turned to fall (some of us are still clinging to fall, right? ), they went all in and helped build a house for a member of the community. The CCRO crew chose to donate their time, energy and (they're quick to point out) muscle to Habitat for Humanity–Central Arizona. Good call, waiting till fall, particularly in Arizona. We're told the crew got so excited they invited others to join them, and on a delightful October Saturday, 25 volunteers from the Cancer Clinical Research Office, the Clinical Studies Unit, The Third Floor Chemo Infusion Lab, and the Appointment Office, along with a few family members, got to work building a Habitat house for a mom and her two daughters. The weather was perfect, and they arrived before the sun. They jumped right in, building and placing wall frames, working on the roof, putting in hurricane clips (in honor of their Florida colleagues, we presume), and nailing the outside walls. The Mayo Clinic crew stood out in their matching red volunteer T-shirts. When the workday was done, there was praise from the new homeowner ("God bless Mayo Clinic!") 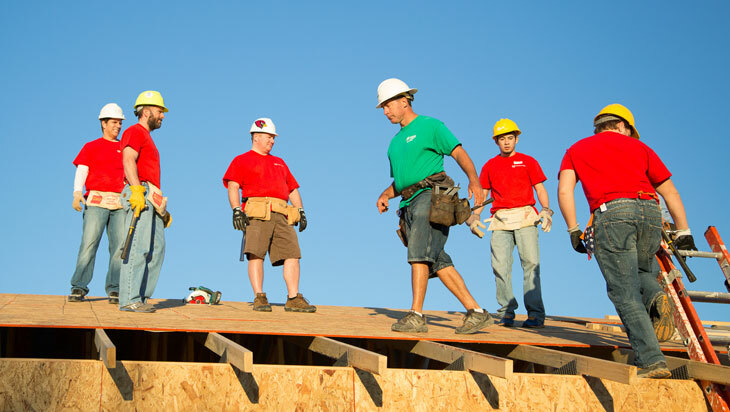 and the Habitat team leaders ("What a hard-working group … When can you come back?"). And they weren't the only ones basking in the glow. "Doing something like this for someone outside of the office really inspires you … It makes you want to do more, be more, personally and professionally," says Shalene Canchola, one of the volunteers. "I know there wasn't one person on the crew that wished they had slept in, or saved Saturday for themselves. Many of us can't wait to put on that red Mayo Clinic volunteer T-shirt, to sign up for the next opportunity to make a difference in someone's life." That volunteer spirit is an extension of the work done they do for patients every day, something they "take great pride in," Canchola says, noting that she "can't wait to see what rewarding opportunities 2014 will bring!" We'll jump on that bandwagon. Pound out a few thoughts of your own with a comment below.